At St. Andrew's-Sewanee School the Theatre is a space for learning and for creating. 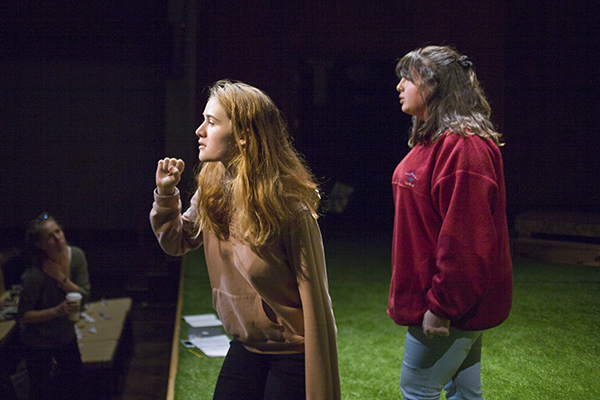 Formal theatre courses focus on collaborative skills, scenework, types of performance and acting methods. Students in both Middle School and the Upper School have the opportunity to audition for productions throughout the year. Most years, the school stages two major productions including one musical. In addition to performance, students may help with directing, scenery and costume design, music, and administrative functions related to the shows. Through the theatre program, students enjoy a creative outlet while honing lifelong skills of public speaking, teamwork and working under strict deadlines. SAS Theatre productions in recent years have included: Cinderella, The Ants, The Adventures of Tom Sawyer, Sweeney Todd, Comedy of Errors, Godzilla, Metamorphoses, a festival of one-act plays, an original collaboration, and a revue of Broadway show tunes. Originally a gymnasium built in 1929 - with its own boxing-ring!, the theatre was transformed in 1981 to provide a spacious classroom and rehearsal studio where students work on acting, improvisation, ensemble skills, creative movement, mask work and classical drama. The adjacent scenery workshop provides space to hone the diverse skills of the backstage world, including carpentry, costuming, scene painting and occasionally special projects, such as puppetry and maskmaking.